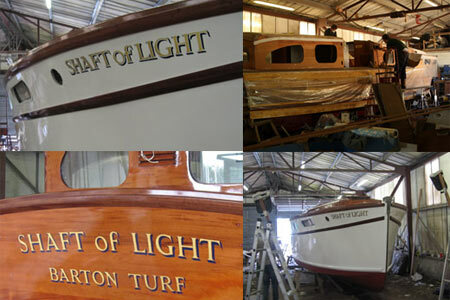 Cox’s Boatyard at Barton in Norfolk is celebrating the completion of the restoration of a classic Broads’ cruiser called Shaft of Light. The 12-month project, which has had up to eight men working on it, has been one of Cox’s biggest projects to date and demonstrates the level of traditional boat-building skills that still very much exist in Norfolk today and which make up an important part of the Norfolk economy. The building of Shaft of Light took place at Herbert Woods at Potter Heigham and was originally started in 1939, but not completed until after the war, due to the war effort taking priority. Once completed in 1946, she became a flagship cruiser of the hire fleet and brought pleasure to many holidaymakers over the following 28 years. When brought to Cox’s Boatyard for repair by her new owners in 2007, much of the wooden infrastructure had rotted and the boat was close to the end of her life. During the restoration, over 400 feet of planking needed to be replaced and many parts of the boat’s frame had to be restored. Throughout the restoration, the team tried to ensure that all the work matched the original design of the boat. Only in a few areas did the restoration project compromise with modern alternatives. One such change was the replacement of the engine with a more modern, environmentally friendly alternative, and another was the use of a modern, epoxy-based paint that is harder wearing and more protective of the underlying wood. The boatyard workshops still maintain ‘soil’ floors that help prevent the wood of traditional boats drying out whilst under repair. Cox’s Boatyard not only offer boat restoration and repair services but also provide moorings, boat cranage, boat safety scheme inspections and boat condition reports. Although known for their work on traditional boats, they also undertake a broad range of repairs on GRP boats.